Sara Zapata and her brother, Emiliano, do their best to survive with their integrity intact while their beloved Juárez is overrun and endangered by a web of criminals that even involve the police and local government officials. Sara is a journalist who writes about her best friend, Linda, the latest girl kidnapped by the cartels. The heartfelt story sends ripples through the community, and the paper receives grateful letters from the families of other kidnapped girls—and death threats warning her to drop her investigation. Meanwhile, Emiliano is prospering after his foray into petty thefts and subsequent capture ushered him under the wing of Brother Patricio, the leader of his explorer club, the Jiparis, and his soccer coach. Emiliano’s a star soccer player and has started a side business selling some Jiparis’ artisan crafts to shop owners. Despite this, he’s still too poor to date his crush, Perla Rubi, so when he’s tempted into the same web of criminals that are coming after Sara and have taken Linda, the pull of wealth and a future with Perla Rubi is stronger than his need to do the right thing. 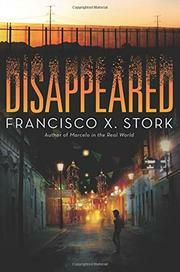 Stork deftly writes criminals who aren’t monsters but men who do monstrous things, and while his understanding of Emiliano’s coming-of-age is fully engaging, he really impresses with his evocation of Sara’s need to navigate the advances of men she knows and doesn’t know and the powerful women equally dangerous to her.